With the right tools and some experience in woodworking, it's possible to tackle the challenging task of building a wooden rowboat. The following instructions are for a rowboat that is eight feet long, but you can adjust it to make it longer or shorter by following a few simple calculations. Add your own twists to personalize it but don't go overboard -- it needs to be a safe before you set sail. Purchase the necessary wood pieces and hardware. You will want to inspect each piece thoroughly to ensure there are no knots, which can lead to leaking. Purchase four to six sheets of half-inch plywood. The screws should either be galvanized or stainless steel and about two inches in length. The epoxy fiberglass will be used as a "glue" and the silicone will be applied to seal the seams. Most lumber yards should be able to supply these components. Start by cutting the stern pieces from one of the sheets of plywood. The top edge will be straight and four feet across. The two side edges will be 16 inches high and straight. The bottom edge will be a little different. Measure two feet from either edge to locate the center of the stern piece and mark it with a pencil. From this point, measure straight down six inches and mark it with a pencil. This will be the "peak" of the bottom of your boat. Cut from both sides to this peak. Your stern piece will look a little bit like the outline of an upside-down house. Cut the two sides of the boat out of the plywood. Make the sides the same height as the side edges of the stern piece: in this case, 16 inches. These pieces should be eight feet in length. Cut a center brace piece to match the shape and size of the stern piece. This will help hold the shape of the boat and give it strength. Use more than one center piece to build for a stronger boat. Cut a bow piece to match the shape of the stern and center brace, but make it 24 inches across rather than 48 inches. You don't need to do any extra calculations: simply trace the shape of the stern piece onto the plywood and then subtract one foot from each side. Attach the stern piece and center brace to the two side pieces using the screws. The top of the stern piece and center brace should be level with the top of the side pieces and the peak will stick out below. Take the bow end of the two side pieces and bend them inward, so they are about 24 inches apart. This may take an extra hand, so enlist a helper. Attach the large clamps to the sides to keep the pieces in position. Attach the bow piece in the same manner as the stern and center pieces. Once they are firmly attached, remove the clamps. Flip the boat over so that the bottom is pointing up. Measure from the peak of each piece - stern, center, and bow. Record these measurements on a piece of plywood that is eight feet long. This will form one side of the bottom of the boat. It will be more narrow on one end than the other. Cut this piece out. Repeat for other side of the bottom. 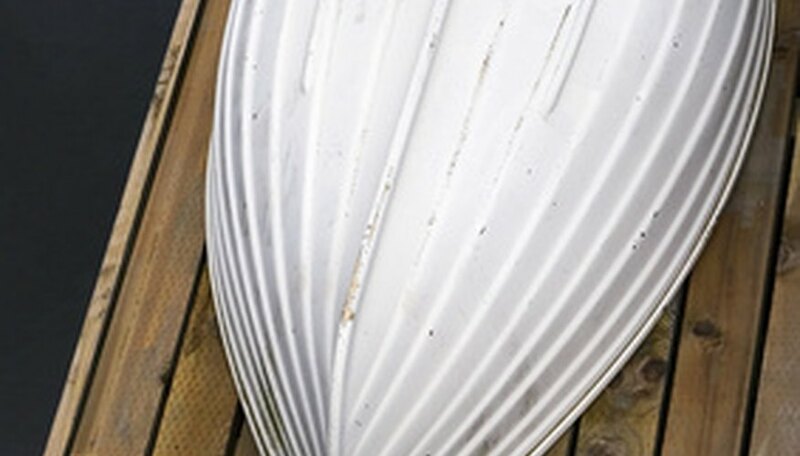 Attach the two bottom pieces to the bottom of the boat using screws. It should actually look like a boat now, but it is not seaworthy just yet. Apply epoxy and fiberglass to all the seams, inside and outside. Most hardware stores sell these materials.Follow the package directions to use. This process will probably take a few days, so be patient. Sand and give the boat two coats of marine-grade paint. You can add a couple of seats very easily by attaching 1-by-2 blocks of wood to the sides and then fitting a piece of plywood about one foot wide across the boat. It should now be ready for the high seas.